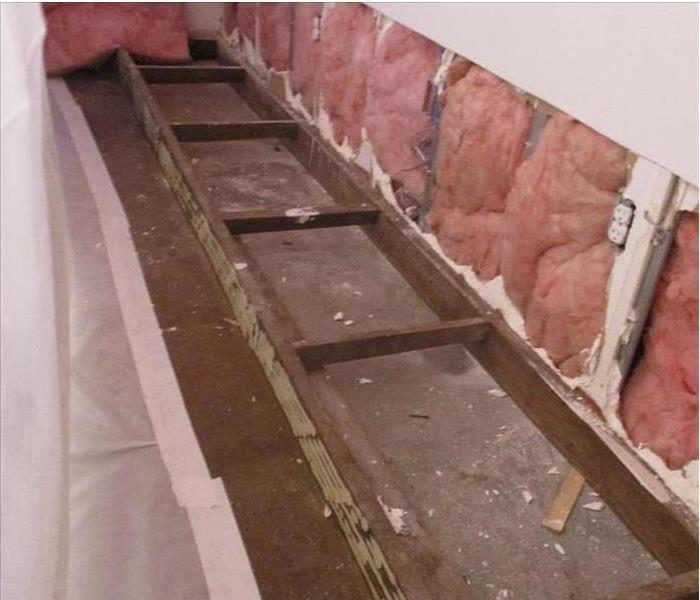 When stormwater categorized as Black Water contaminates the lower level of sheetrock, it generally has to be discarded. SERVPRO can come to a Tallassee area building and do a flood cut. This also opens up the walls and the studs for antimicrobial treatment. 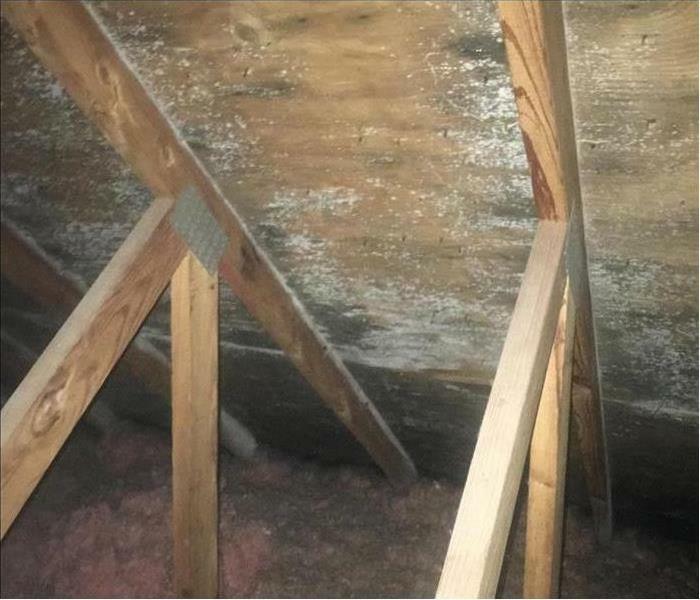 Roof leaks and insufficient insulation often lead to mold infestations in Tallassee area attics. SERVPRO can use a technique called "ice-blasting" to remove the growth without flooding the area with water. Then an antimicrobial product protects against future mold growth, once the repairs have been completed. Water damage at this Prattville home was the result of a roof leak during a thunderstorm. 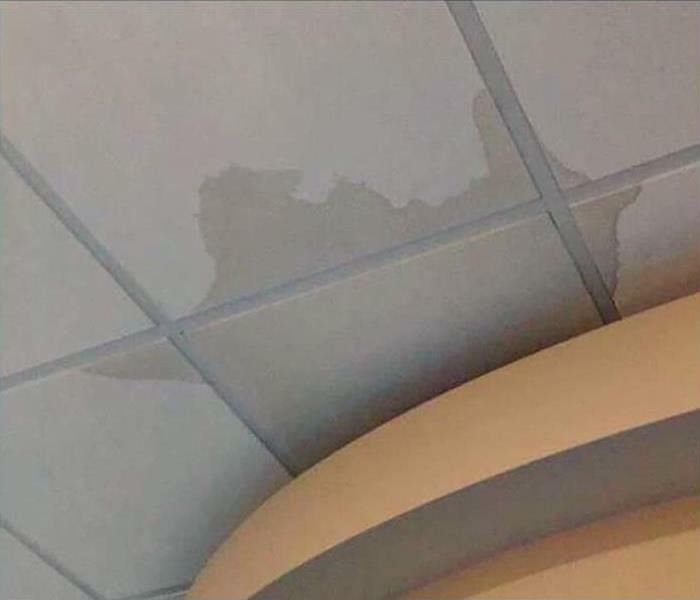 The ceiling gave way to the water leak during the night. The owners needed help, and they needed it fast. Rainwater was pouring into their home. SERVPRO of Prattville provides emergency service 24/7. 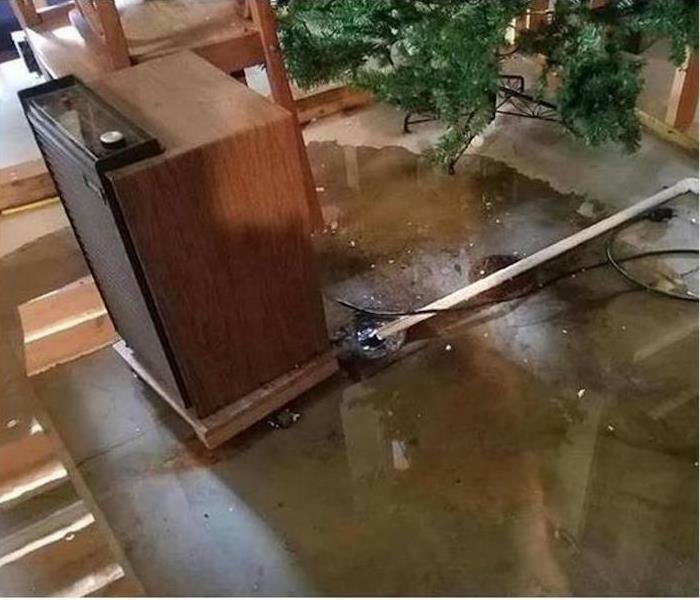 We are uniquely equipped to handle water damage events such as this. We are armed with the latest equipment available and industry certified technicians to perform the work needed. 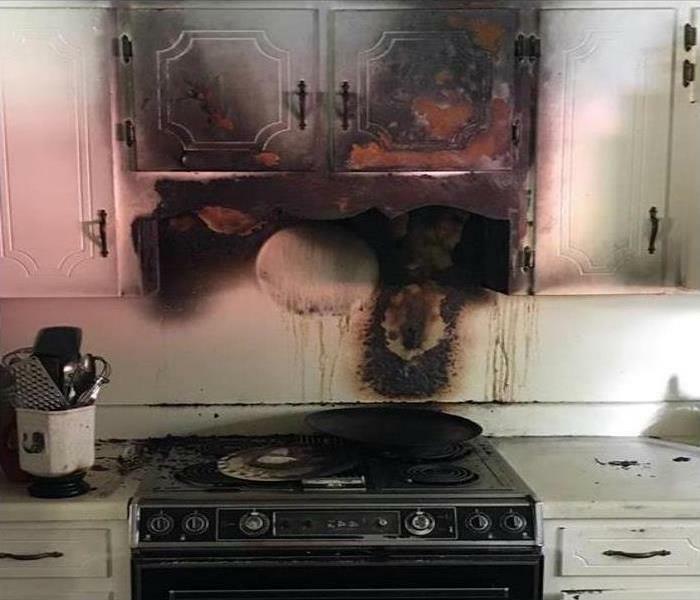 Though the fire caused little damage to this Wetumpka kitchen, the smoke odors and staining of the ceiling and cabinets needed some professional help to clean. Enters SERVPRO, with a team of skilled technicians, to wipe down the sooty stains and neutralize the foul odors caused by the fire. You can count on us, every time. 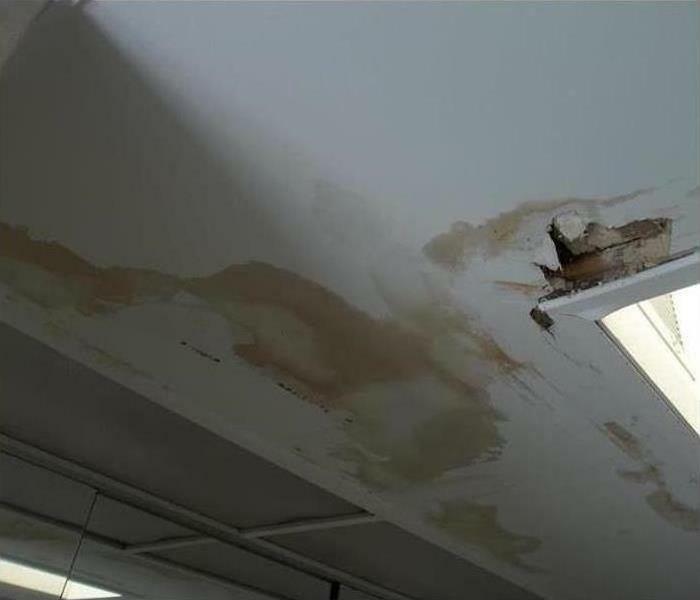 Driving rains that breach a roof are often the cause of major water damage to a Prattville building. 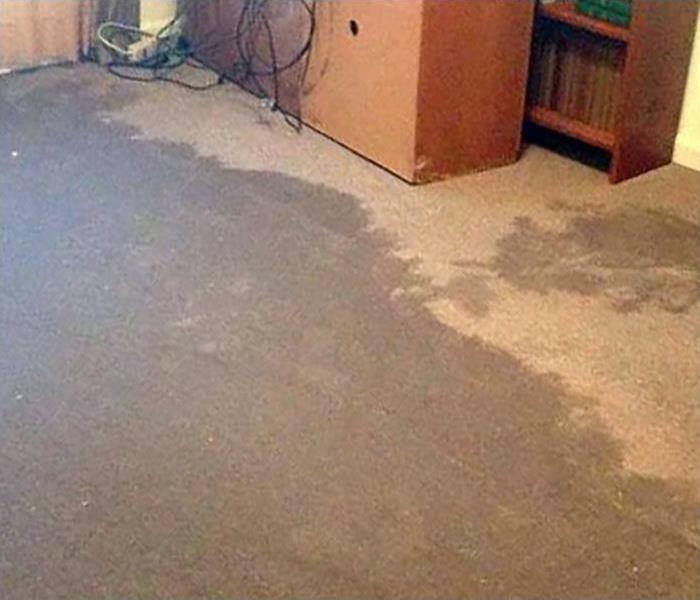 Once the storm subsides, the damages can be mitigated to the initial shock with a fast water removal service. 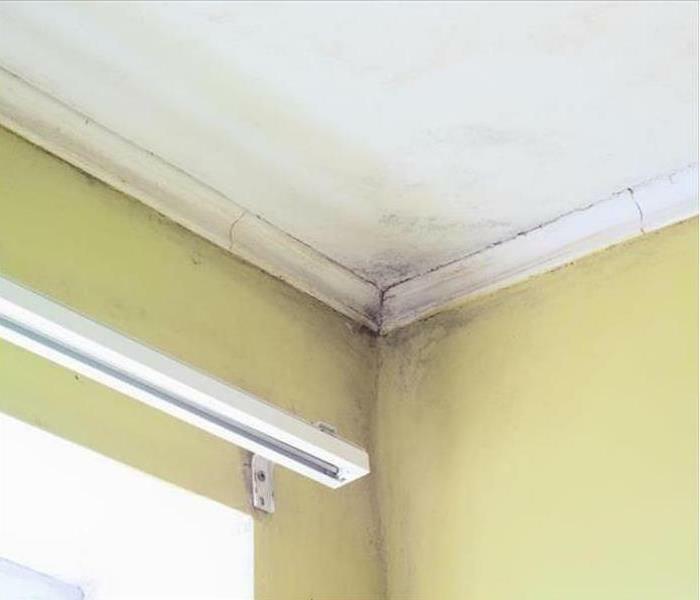 The remaining moisture that has soaked into the ceiling panels, insulation and supports can be dried more rapidly with the use of injectidry technology. The hoses (tentacles) are blowing heated air into the attic void to increase the rate of evaporation with the air movement and also to hold more water vapor. 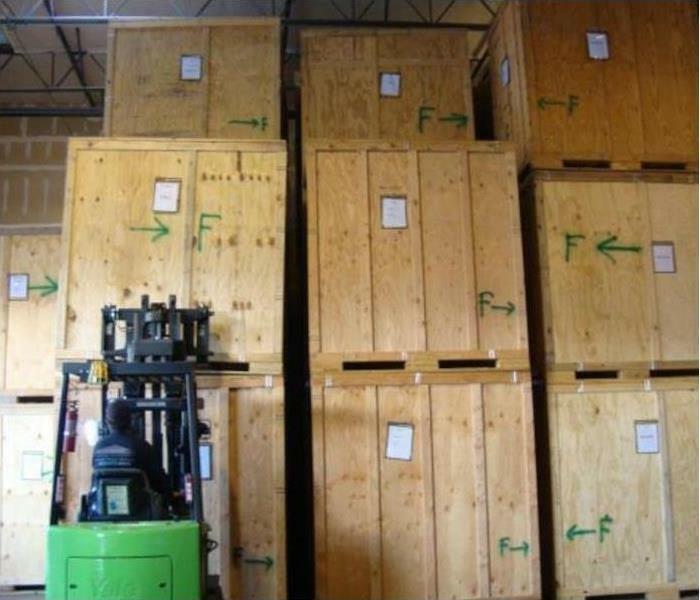 With an increased RH relative humidity, the dehumidification equipment can condense this airborne moisture into containers thereby minimizing the drying time. Rely on the techs from SERVPRO for storm-damaging cleanup and restoration. 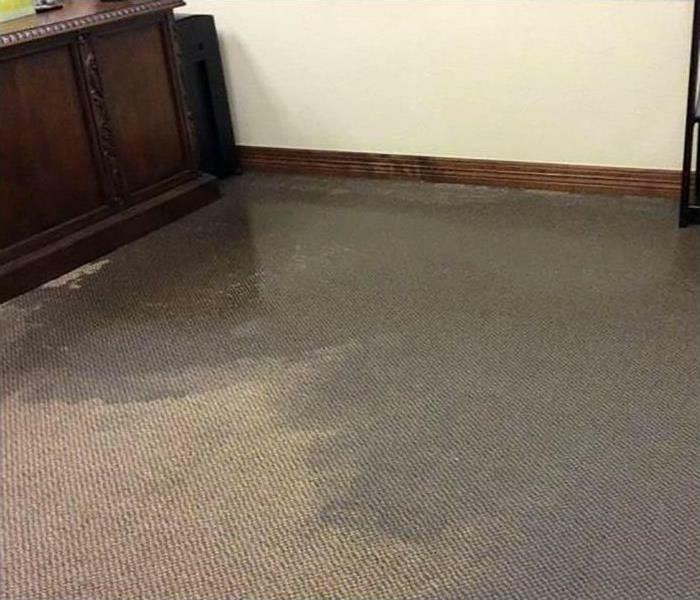 Water can cause significant damage to your commercial property, and our team is your best choice for a successful outcome. 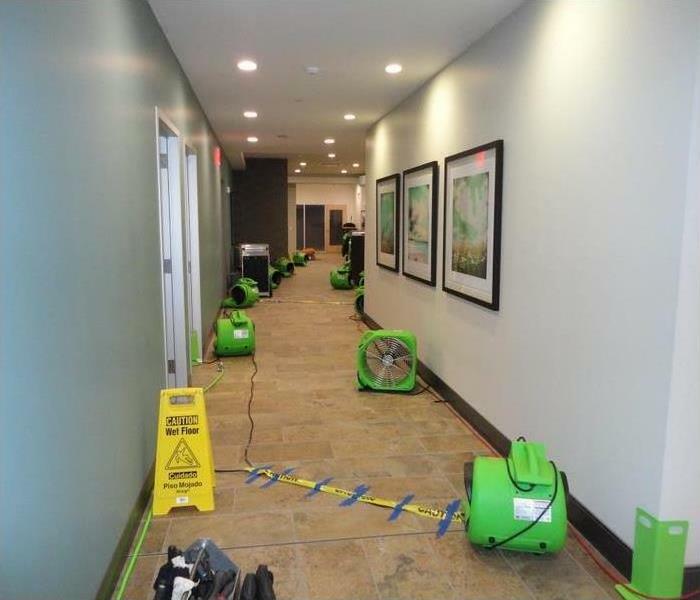 SERVPRO has the specialized training, experience, and state-of-the-art equipment to handle any size commercial water damage emergency. SERVPRO of Prattville is Faster to Any Size Disaster! Storm damage in Prattville can sometimes take on enormous proportions. 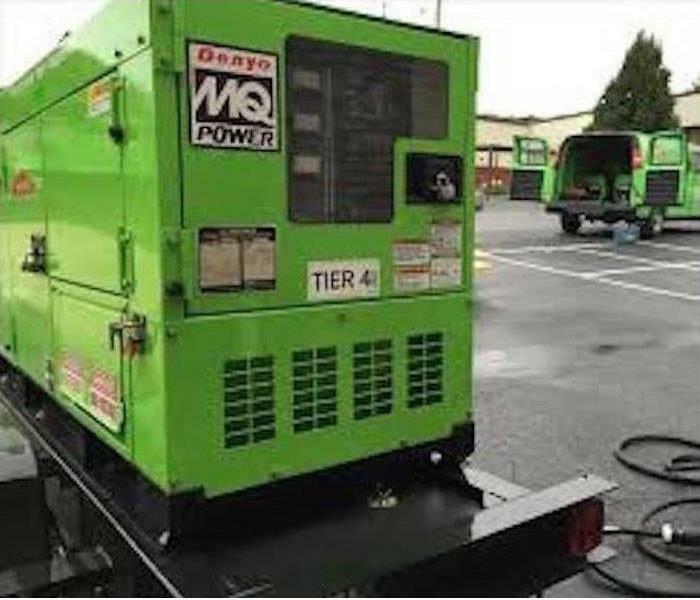 When large loss events are encountered there is a need for a lot of equipment and a lot of trained technicians to operate the sophisticated equipment required for storm damage restoration. SERVPRO is prepared to help. Fire damage at a Wetumpka home produced a lot of soot and smoke damage. To make space top treat the property and the contents would be packed up and transported to SERVPRO of Prattville’s warehouse. There they would be cleaned and restored. This procedure also allows easier access to the damaged area of the dwelling. Commercial mold damage at this Prattville warehouse resulted when a small water supply line developed a leak. The moisture it deposited led to the growth of a mold colony. 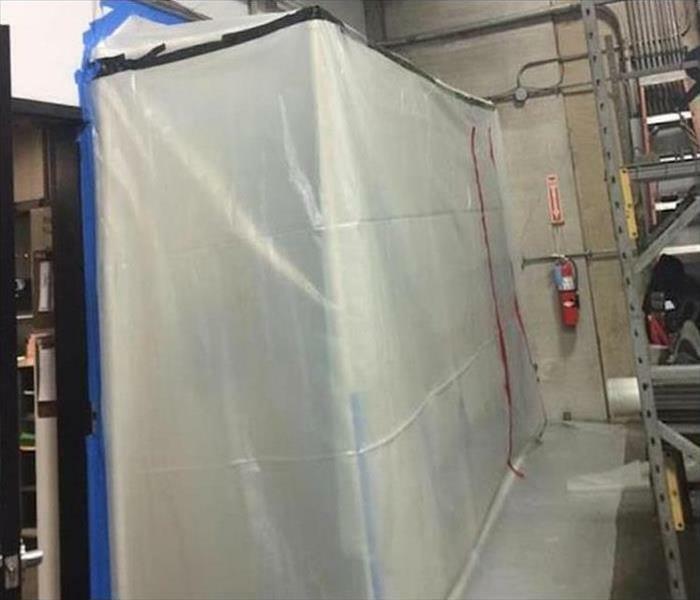 Shown is a containment area that would be used by our technicians to prevent mold spores from traveling throughout the facility while we cleaned up the mold. 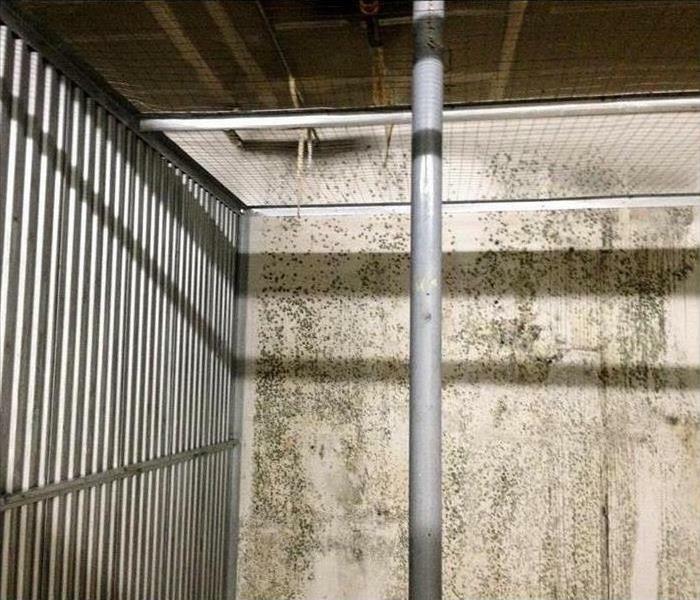 Mold growth, needing remediation, develops quickly in basement and storage environments cut off from proper air circulation to minimize moisture buildup. If caught in time, SERVPRO can scrape off the patches and salvage the walls. 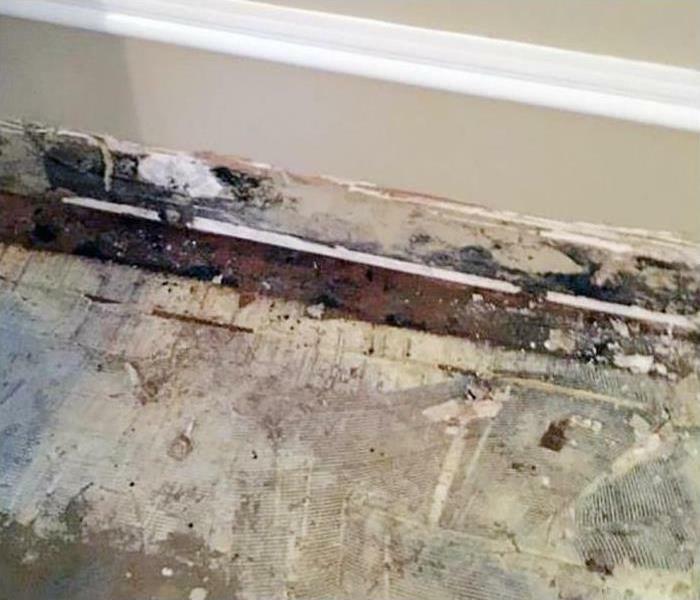 Stormwaters not only wet and ruin drywall and flooring elements, but disinfecting of the affected areas is needed because of the contaminants swept in with the rushing waters. Call SERVPRO in Wetumpka to clean up and restore your property. 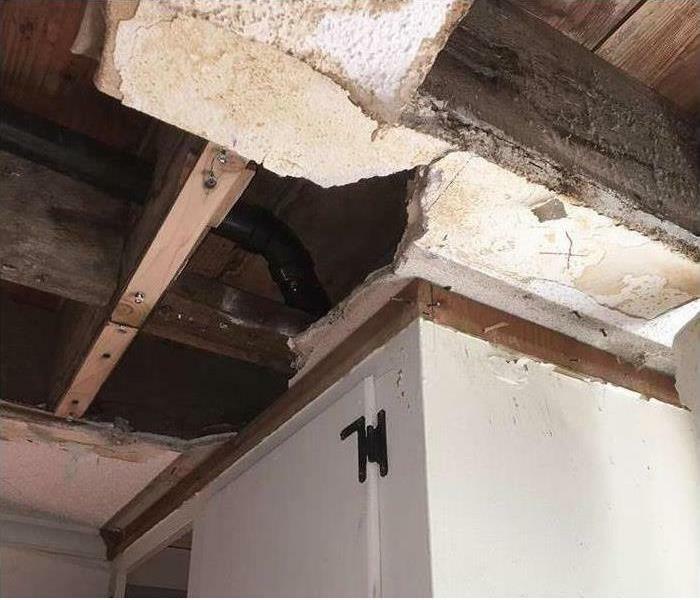 When walls in a Prattville house get soaked resulting in non-salvageable materials, SERVPRO can cut out the damaged material and then dry the insulation in the wall cavity. Moisture metes can then indicate when standard dryness levels have been reached. 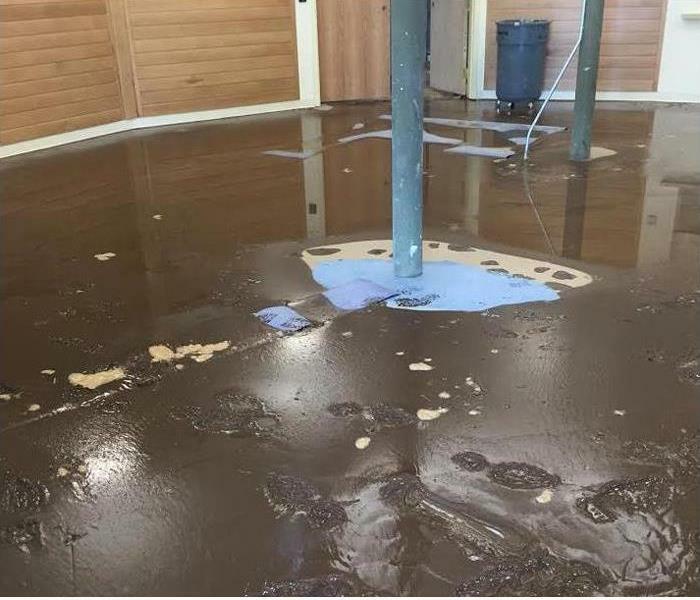 The muddy deposit of contaminated water covered this basement floor in a commercial building in Wetumpka. 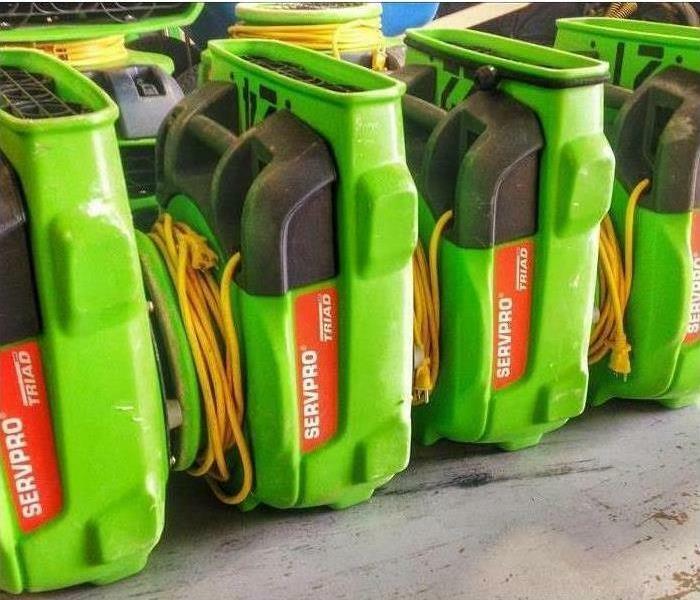 SERVPRO crew members can use equipment from our Green Fleet to clean up the muddy debris and disinfect the affected area. A space heater ended up causing a fire in the corner of this Tallassee home. 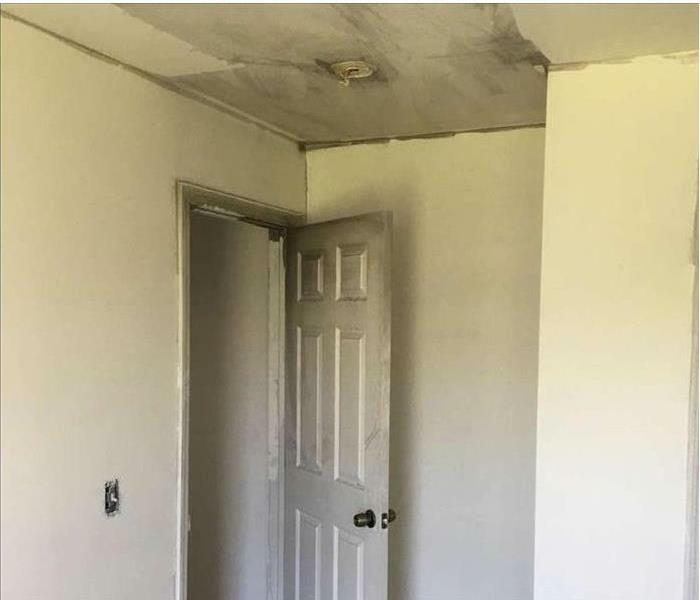 If drying out the moisture, removing the charred walls, and deodorizing the area, is performed by a SERVPRO technician, the damages are mitigated. What cannot be undone can at least be restored. 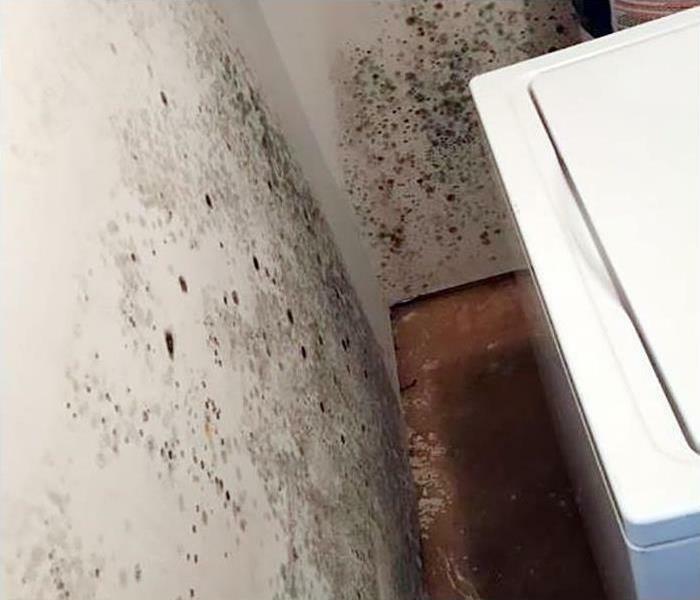 Mold damage at this Prattville home was discovered in the bathroom during a remodeling project. The foreman on the remodeling crew was familiar with SERVPRO of Prattville and recommended us to the homeowner. The homeowner contracted with us to clean up their mold damage. 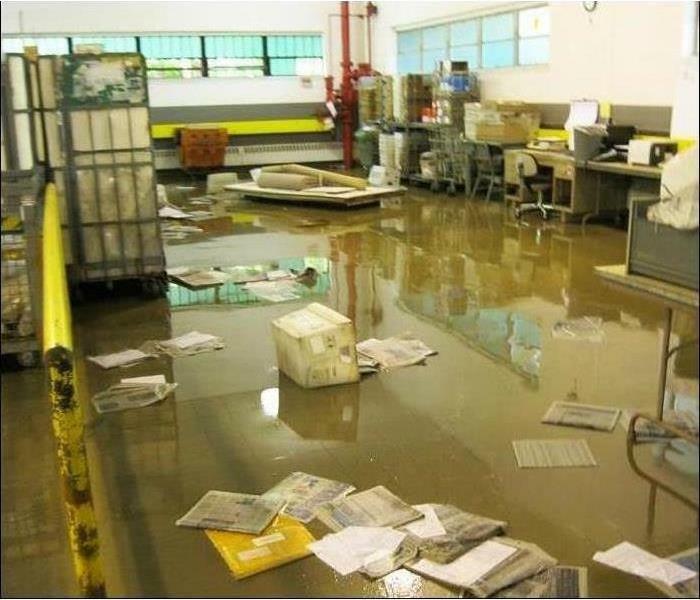 Commercial water damage is often accompanied by power outages or lack of enough power to run the sophisticated water damage restoration equipment employed by SERVPRO of Prattville. When this happens, we must be ready to supply our own power. 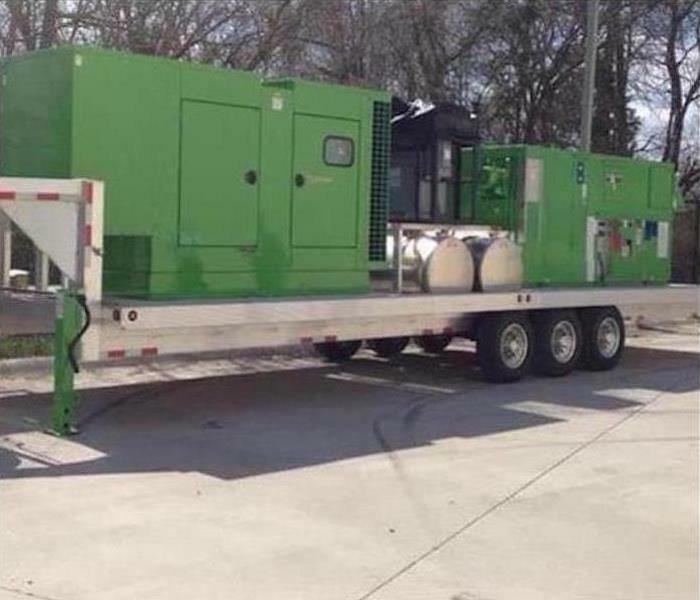 Pictured is a large commercial generator that might be used on such occasions. Leaks that go unnoticed or ignored become damaging water problems as illustrated in this Wetumpka ceiling. Demolition by SERVPRO crews can prepare the affected areas for restoration after the drying process has been completed and documented. Some fire damage leaves a sooty coating on homes in Tallassee. 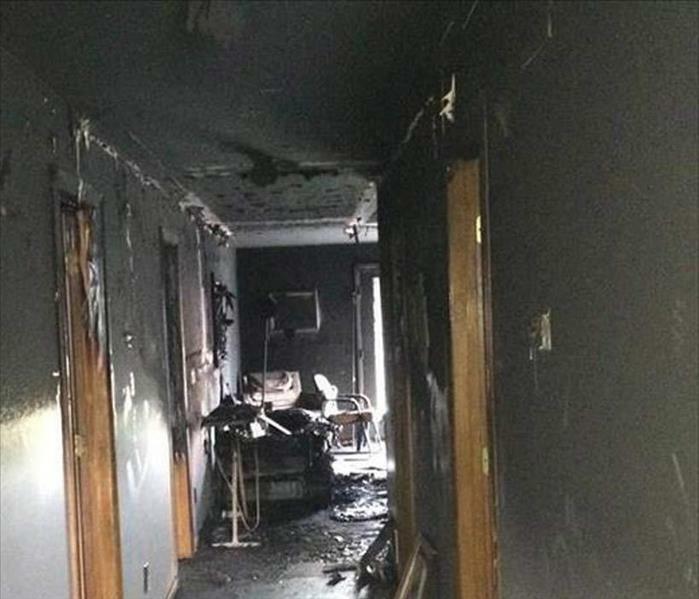 Not every blaze results in charred possessions and temporary displacement. SERVPRO technicians have the skills and equipment to wipe down these stains and make it "Like it never even happened." Storm damage struck this Prattville office and warehouse combination when large windows were busted out during the storm. As the photo shows, we had a great deal of debris to deal with and the standing water. We cleaned up the debris and removed the water with truck-mounted pumps. Commercial water damage can reach daunting proportions in Prattville. 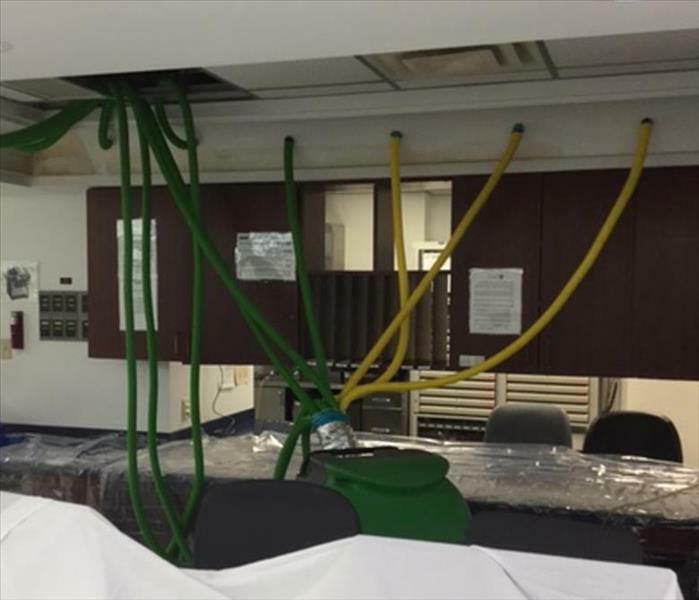 When this type of large loss occurs, SERVPRO can provide like-sized commercial equipment to handle the increased work of the project. Pictured is a trailer mounted desiccant dehumidifier. 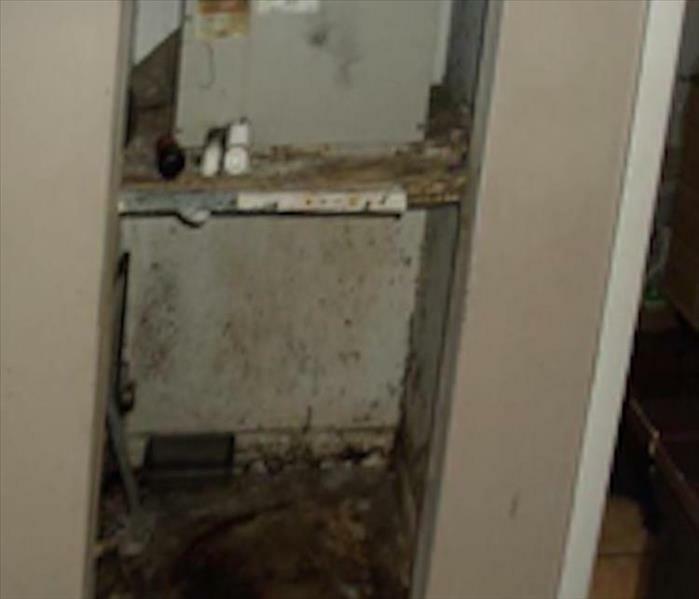 Mold remediation to remove and sanitize this utility closet in Tallassee was done by SERVPRO AMRT applied microbial remediation technicians. The cleanup, done with the use of HEPA filtered devices prevented the spreading of mold spores to unaffected rooms of the structure. 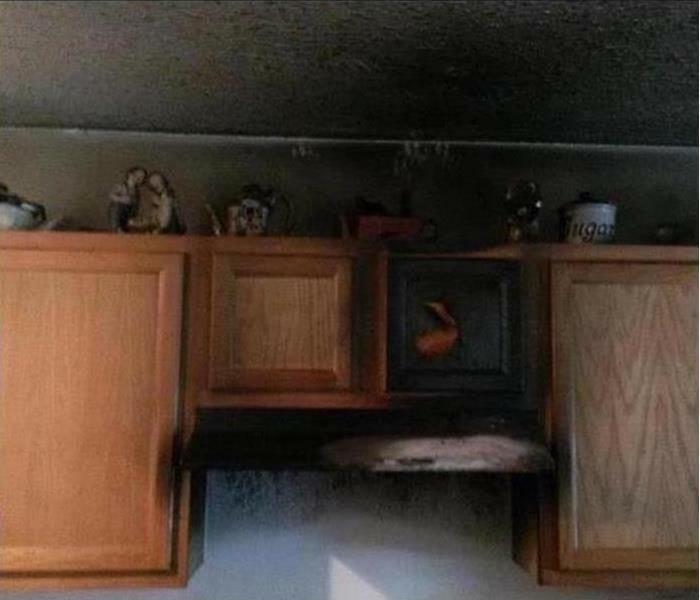 Fire damage at this Prattville kitchen began with a grease fire on the stove top. 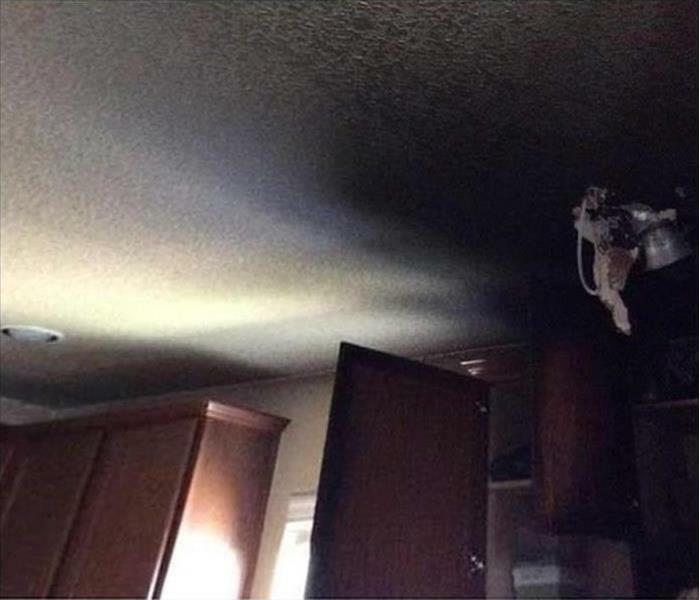 The homeowner reacted quickly and extinguished the hot grease fire. WE were called in to clean up the residual damage of the fire. 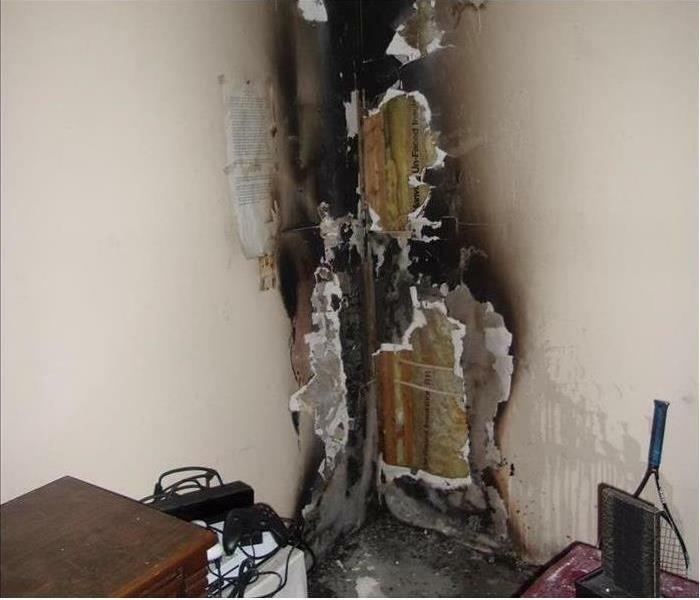 There was a significant amount of soot and smoke damage which needed to be cleaned as well as the residue from the fire extinguisher. Water damage to this Prattville home saturated the carpeting. 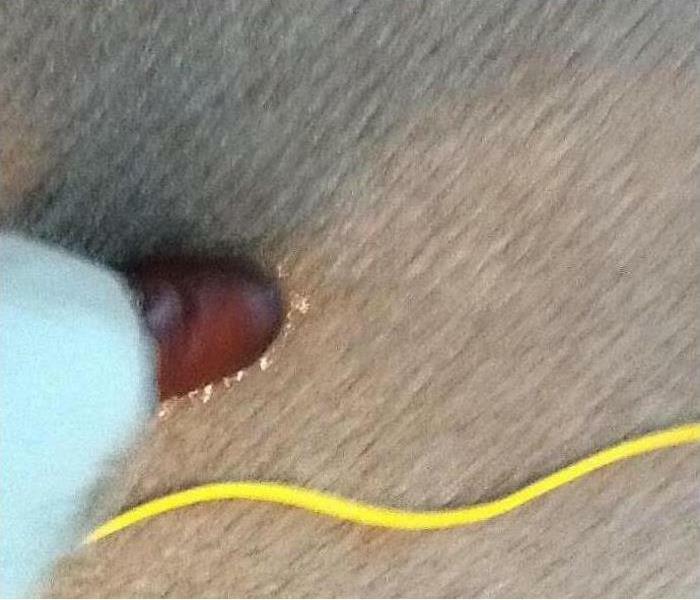 The photo shows the water pooling on top of the carpeting as the SERVPRO technician steps on the floor. We managed to clean up the water in a short period of time preventing the need to take the carpeting up to dry the subfloor. The positioned air movers and dehumidifiers are removing the residual moisture in the air from this office building in Prattville. The tile flooring and vinyl coving helped to minimize the water damage. The key was to prevent the moisture from damaging furnishings and electronic equipment. Fast removal from our SERVPRO team also helped to mitigate damage. 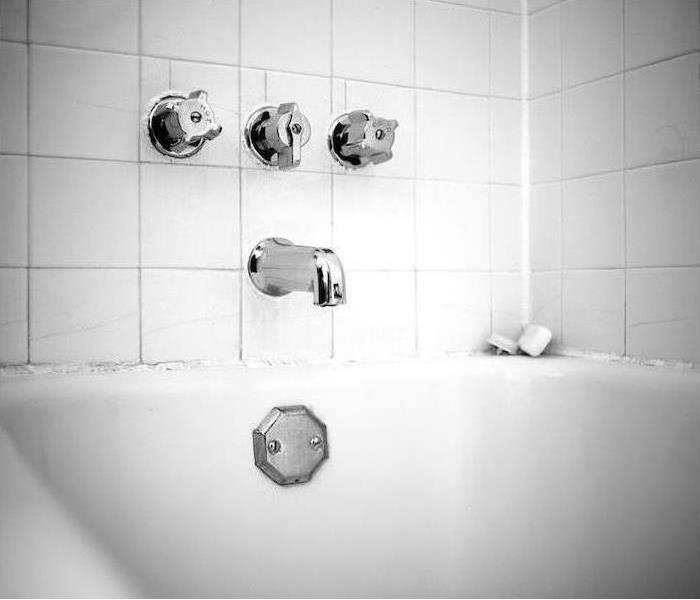 Mold damage in this Prattville bathroom developed when the caulking hardened around the bathtub and shower area and then cracked. 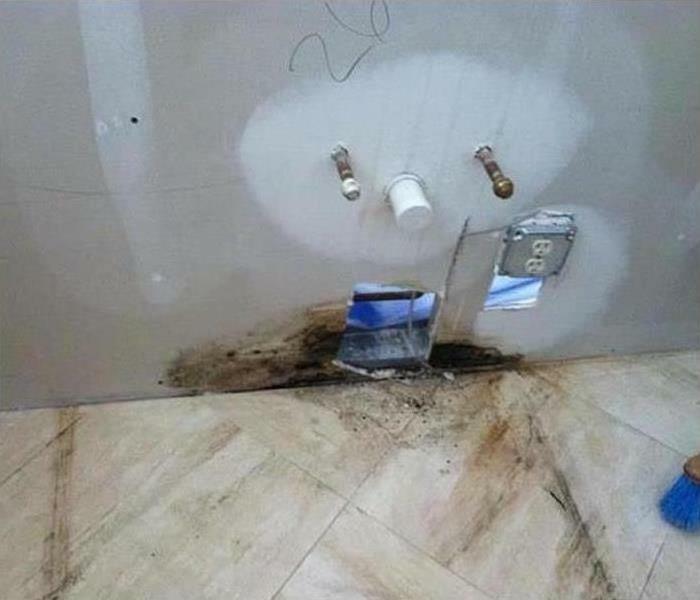 This allowed moisture to seep through to the drywall and studs behind the tile. Storm damage left standing water at this Prattville house that was undergoing a remodeling. 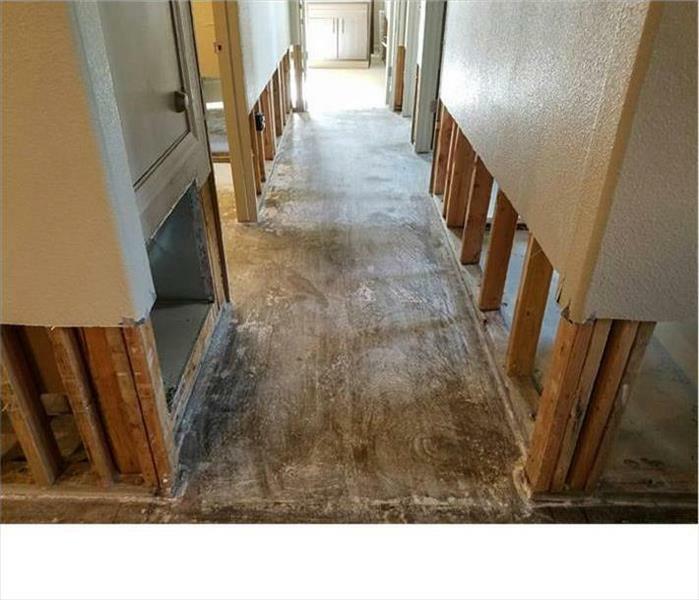 SERVPRO was contracted to clean up the water to save the framing that was exposed to the standing water and to disinfect and sanitize the affected surfaces. 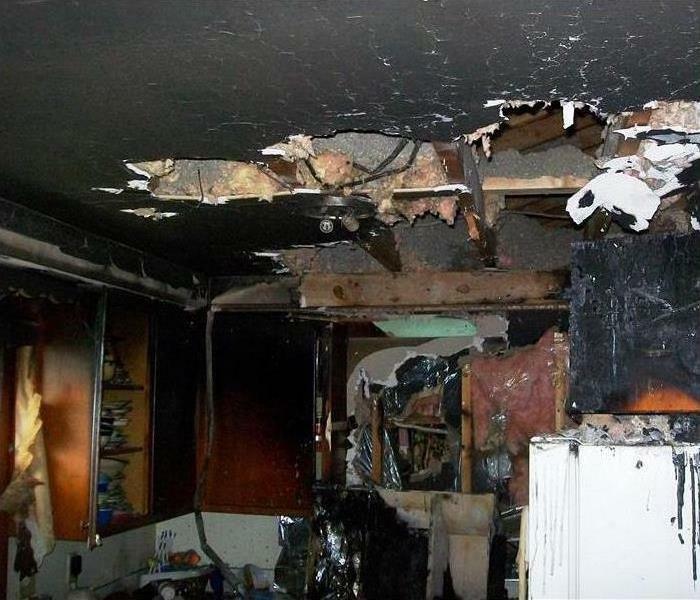 This type of damage calls for a major fire damage cleanup before any restoration and rebuild can follow. The safety of the workers is paramount to this task, and protective helmets and equipment were worn because of the danger of falling debris. SERVPRO techs come ready to work. Water damage in a Prattville home cannot always be seen or felt. 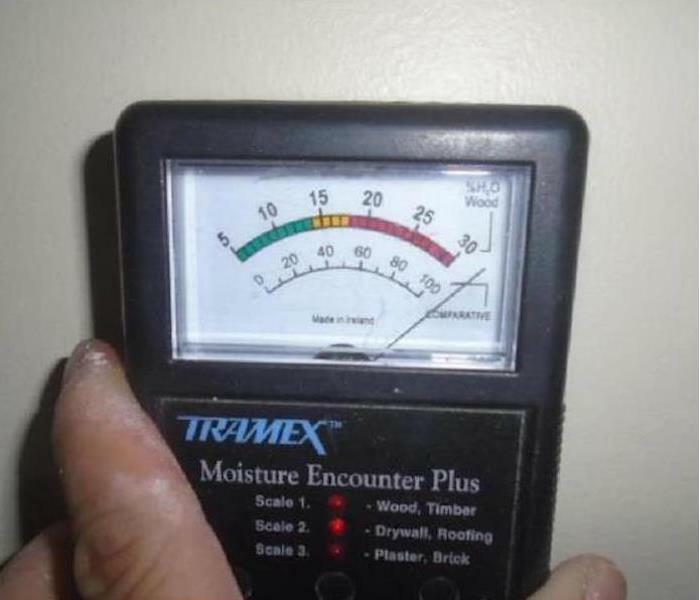 That is why SERVPRO of Prattville employs the use of high-tech moisture detection devices to locate hidden moisture. 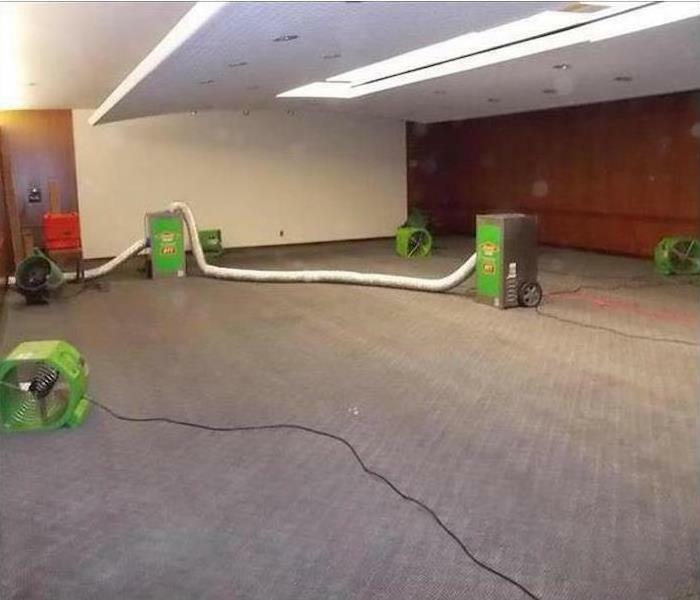 Commercial water damage occurred when the automatic sprinkler system accidently activated and soaked the industrial carpeting in this conference room. We used commercial extractors to clean up the water and then placed air movers and dehumidifiers in place to aid the drying process. The smoke damage to this home in Tallassee was more ruinous that the damage caused by the flames. We discarded charred materials before we could set up ozone machines to remove the odors from this vacated property. We finally completed the service with a thermal fogging to neutralize any hidden smoke particulates. 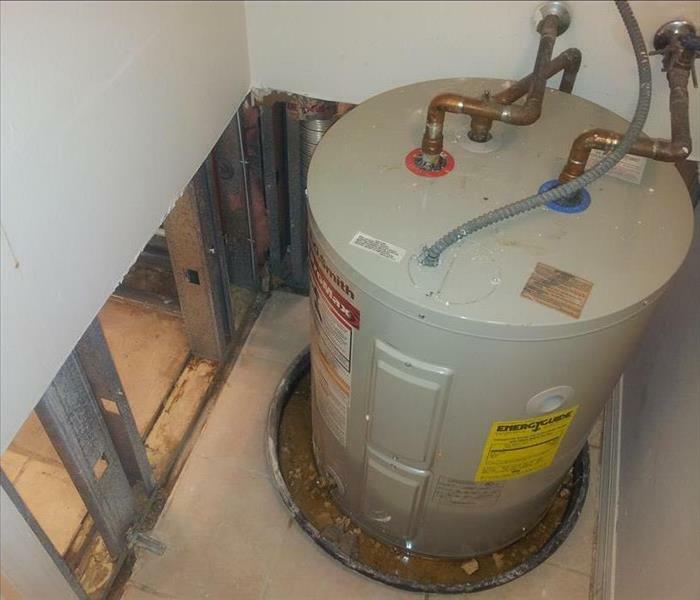 The water heater was functioning, but the cold water supply had a leak at a joint and dripped water into the catch pan. The house was unoccupied at a time, so the overflow of water wicked up into the porous drywall. Our SERVPRO tech cut out and discarded the non-salvageable material and dried out the area before reinstalling new drywall. Crews from SERVPRO of Prattville raced to Houston, joining a compliment from our branch offices at Montgomery and North Lilburn Georgia, in the effort to aid the people of Houston displaced by the city's worst recorded flooding in 200 years! 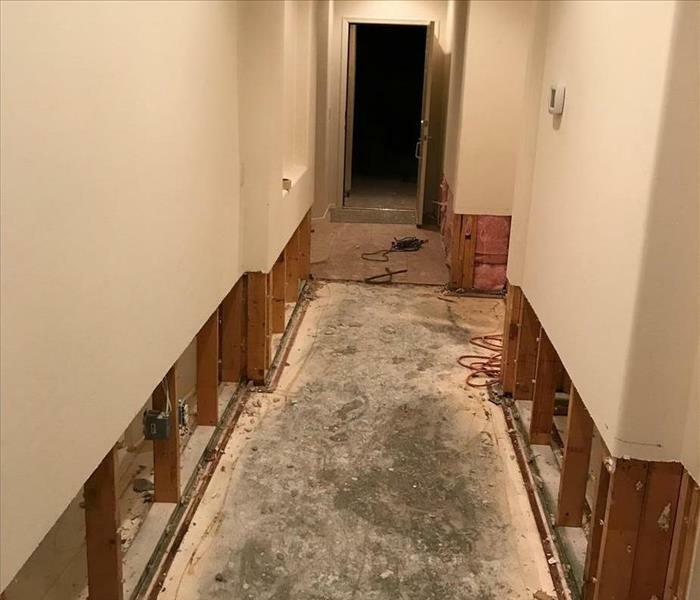 Restoring a home that has been flooded by grossly contaminated stormwater requires unique equipment, products, and technical training. 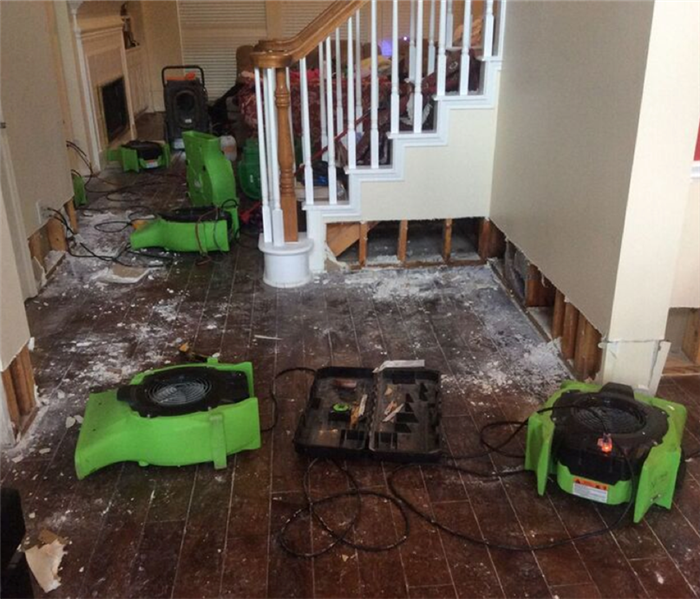 The equipment you see in the photo above is designed to liberate moisture trapped even in dense materials such as concrete, structural wood, and hardwood flooring by hot air circulation, and then removing it from the premises with powerful dehumidifiers. During the five days we were there, we were able to restore the homes of about 50 families in the Houston area, but without the expert assistance of employees like Greg Gasz, our Large Loss Resource Coordinator, it wouldn't have been possible. A special thanks to the crew members who volunteered to spend five days and nights away from family.